MPPT charge controller or Maximum Power Point Tracking is an algorithm that is included in charge controllers and used for extracting maximum available power from Solar PV module under a wide variety of conditions. The voltage at which the PV module can produce maximum power is called ‘maximum power point’ (or peak power voltage). Maximum power varies with solar radiation, ambient temperature and solar cell temperature, thus the MPPT solar charge controller is embedded with MPPT algorithm to maximize the amount of Energy supplied to the battery from the PV module. MPPT solar charge controllers are different than the traditional PWM solar charge controllers in that they are more efficient, and in many cases more feature rich. MPPT solar charge controllers allow the solar panels to operate at their optimum power output voltage, improving their energy producing performance by as much as 30%. · Microcontroller based Design suitable for Solar PV applications. · Uses PWM (MPPT) technique with fixed frequency for Battery charging under various conditions. · Easy to Install and Maintain. · Selection of Various Voltage configurations using DIP Switches (2 no’s )/ Automatic mode for selection of the Voltage configurations between 12, 24 and 48 V.
· Temperature compensated 4 Stage (Boost /Absorption/ Float / Equalize) charging. 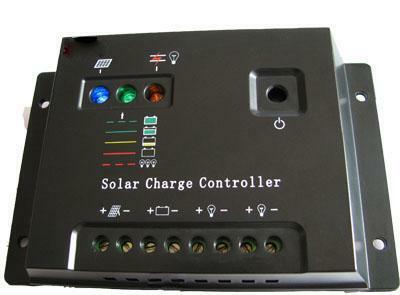 · Supplying the load is based on selection of mode in the charge controller. · Temperature compensation for better battery charging for various climate and terrain. · Two LED Indicators for indicating Battery Energy availability and solar charging indication. One LED for Power ON Indication to enable us to know the LOAD Power availability. Ø LVD compensated with the discharge current of Battery. LVD varies based on the Load. Ø Maximum Peak Efficiency of circuit: 99% ( PWM ) , > 98 % ( MPPT ). Ø Idle Power consumption: < 20 mA ( PWM ) and < 30mW ( MPPT ). Ø Load Voltage Ratings: 12/24/48 V.
Ø Load current: 10/20/40 Amp. Ø Battery charging temperature compensation coefficient: -5 mV / Deg Centigrade and a range of -30 deg C to +80 deg C.
o Battery deep discharge protection using LVD which ensures long life of battery. o Battery over charge protection. o Short circuit protection at load using software. o Over load protection using software. o Solar panel reversal protection. Ø Real Time Clock integration for implementation of Equalize charging every 1 – 3 months interval depending on the type and make of the Battery / as per Manufacturers specs. Ø External Temperature sensor for Battery temperature monitoring. Ø Indicators for Faults and Alarm Like: High Voltage disconnect, Abnormal battery temperature, high ambient Temperature, Abnormal Battery voltage sense, Type of charging and Battery state of charge. Ø Battery ageing indicator using 4 LED’s. If all 4 LED’s glow this indicates the battery is not retaining any charge in it and battery has come to end of its life. Ø 16x2 or 20x4 LCD display for functionality indication. Ø Protections Like: Solar over Charge protection, Protection due to Short circuit at the Solar panel, Protection against high I/P voltage at the Solar I/P. Ø Battery Lower cutoff disconnect voltage set based on the load discharge profile. Ø Data Logging and storage on SD card. Ø Ethernet port with Web server for remote data logging and configuration. 1. 2 No’s for Voltage selection. 2. 3 No’s for Battery Type selection. § For Data logging in future. § For changing the battery cutoff levels based on requirement. § For energy metering in future.